My favorite look on a child is a dirt covered face. Seriously seeing the little dirt lines on their cheeks just makes me melt. I spent my summers on the muddy banks of the Kaskaskia River. Digging in the banks where the craw daddies gathered and the fishin’ was good. When I wasn’t digging in the mud I was playing army in the woods with my brothers. We were covered head to toe in dirt, grass stains, and probably worm ooze from baitin’ our fishin’ hooks. Fortunately my minions take after their momma. They love to dig in my back yard and collect “samples” of grass blades, rocks, and dirt. So honestly when they come to me offering a mud pie, I am well aware that they have probably already taste tested this amazing dish. Their offer for me to taste as well is very sincere. It is amazing to watch them learn and make new discoveries daily. It doesn’t bother me that they’ve just shoveled grass and dirt into their mouth. It doesn’t bother me that they’ve licked the shovel that they used to dig a hole for their dirt pie.God made dirt! Oh so often kids are found in therapy offices playing in sensory tables and gadgets designed to help with their occupational therapy needs. They play with sand, beans, and more trying to awaken their senses. However, we seem to forget the best tools for therapeutic play are literally outside our front door. 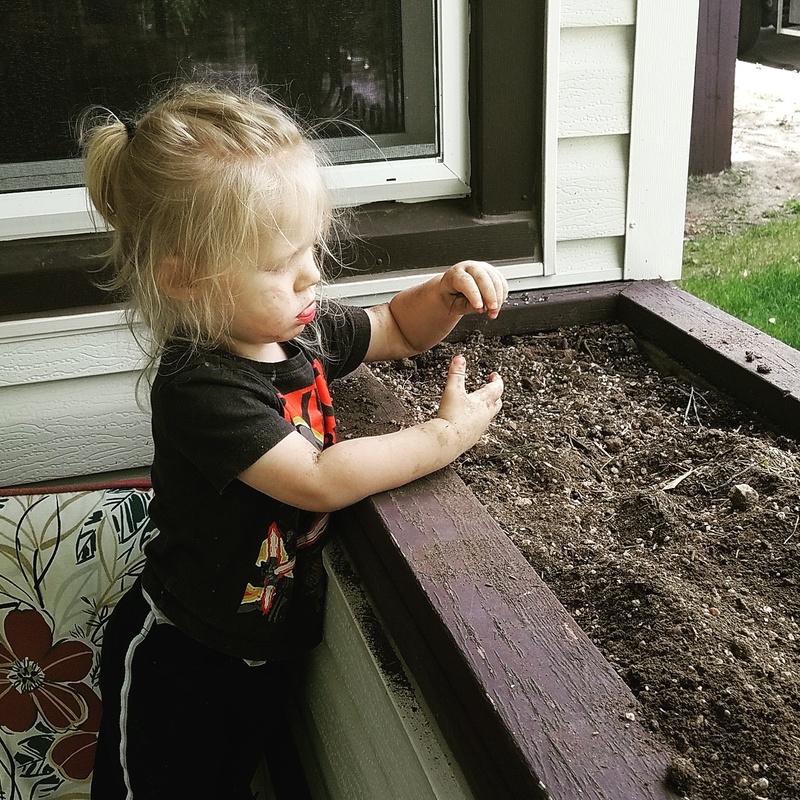 This flower box is meant for a beautiful display of colorful floral arrangements, but instead I left Raylan to play, feel the dirt on his hands, and run his fingers through it. You see children need to build their immune system and be exposed to the environment around them. Exposing our children to the germs and allergens around them helps produces immunity too many adulthood challenges such as allergies, bacteria , and microbes. So, yes I let my children eat dirt and play on the mud. When we are camping or fishing they possibly don’t bath for two days or so. Aside from the generic face wash their little bodies are covered in the dirt and grime of nature. Between mud pies and grassy dirt smoothies my children are always eating or drinking dirt and I let them. I would not have it any other way, because God made dirt and dirt don’t hurt.